No-one who watches TV News could have missed the intrepid Housing and Immigration Ministers in Ealing going on raids of ‘beds in sheds’, outbuildings being used illegally as accommodation. On the same day they published guidance on dealing with rogue landlords. The issue of rogue landlords is a serious one that we have drawn attention to on many occasions. ‘Beds in Sheds’ is just one manifestation of the problem of landlords exploiting poor and vulnerable people by providing substandard or hazardous accommodation. There should indeed be a crackdown and guidance describing all the various powers and the different possible approaches is a good idea in principle. However the presentation of the Ealing raid was more about immigration than it was about poor housing. The fact that the foreword to the guidance is jointly penned by Grant Shapps and Immigration Minister Damien Green – together with the well-planned TV raid discovering 39 tenants, 22 of whom were illegal immigrants – tells us something about the message the Government wanted to get over. The guidance doesn’t tell us what proportion of rogue landlord properties contain illegal immigrants but they want us to have the impression that this is the bulk of the problem. By implication, if illegal immigrants are identified and removed the problem of bad conditions will have been tackled. Grant Shapps has form in this regard. Our blogger Monimbo noted that the recent guidance on housing allocations devoted 17 of its 46 pages to the issue of immigration, largely repeating previously-issued guidance but demonstrating a slightly obsessive interest in one aspect of the policy. The issue is much bigger than beds in sheds and much wider than illegal immigrants. The guidance itself has examples: including an overcrowded flat above a shop with residents who were not identified as illegal immigrants and therefore presumably were not. The overall impression given is that Councils and other statutory agencies just need to get their act together by using their wide range of powers. There are two basic problems with this. First, the guidance does not mention the issue of resources apart from making much of the £1.8m fund the Government has disbursed – enough to employ fewer than 50 qualified officers across the whole country for a year – which is trivial when compared to the cuts being made to such services. Dealing with rogue landlords is intensive time-consuming work, often involving legal and other enforcement action, and most Councils admit that they struggle to keep up with the caseload. Secondly, and dealing with probably the most important issue last, the guidance skates over the issue of homelessness. Enforcement action on rogue landlord properties carries a high risk – indeed a likelihood if the accommodation is illegally provided – that the residents will be left without a home. This is why people do not complain about their poor or hazardous conditions and also why enforcement agencies tread warily. This is the core issue around enforcement, and you would expect guidance to cover it in some detail. Suitably, the guidance has a section called ‘Preventing Homelessness’ but 2 of the 3 paragraphs talk about immigration status. There is not one mention of the statutory homelessness safety net, the rights of all households to assistance and the rights of priority groups to be secured accommodation. It says Councils ‘will want to consider the impact of their action on tenants’ but its only guidance is a short reference to agencies ‘picking up’ people who might otherwise sleep rough. Homelessness gets two mentions in the guidance, immigration gets 22. Given the detailed consideration the guidance gives to the mechanics of immigration, the lack of proper consideration of homelessness renders it almost worthless. 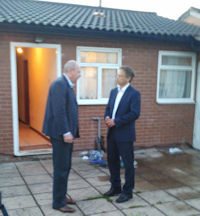 It tells us more about Grant Shapps than it does about rogue landlords. Steve, the most important issue is the spread of professional criminality in the landlord business. As well as sheds with beds, the pilot survey in Newham found 25% of “tenancies” cash in hand with no paperwork. We need a set of new criminal offences, starting with the simple principle that there can be no lawful tenancy if the offer is made be someone not entitled to make it and/ or if the premises are not lawfully a dwelling. Penalties must include confiscation and prison sentences and this would include crimialising unlicensed Houses in Multiple Occupation, flat conversions without building regs or planning approval, and sub-letting. I think that you should accept that we need to address the problem of illegal immigration and if it puts additional demands on housing it worsens the problems for everyone else. I do agree that many authorities seem to be reluctant to tackle the issue of sub standard accomodation and rogue landlords probably for a variety of reasons. In my opinion all Private Landlords should be required to be licensed and any accomodation that they let should be required to meet minimum standards, and they might grumble about regulation, I think that many good landlords would like to see the rogues eliminated. The previous Government had started to look at the issue unfortunately Grant Shapps consigned it to the wastepaper basket.